Help your window air conditioner cool more efficiently in the summer and help prevent heat loss in the winter. Made of highly compressible open cell polyurethane foam. Q: Does the Outdoor Window Air Conditioner Cover also cover the bottom of the air conditioner? Yes. 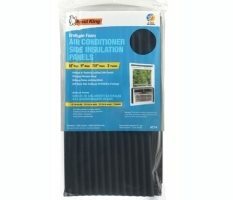 Outdoor Window Air Conditioner covers are made to cover the bottom of the window unit AC. Discover other window air conditioner accessories to ensure year-round comfort. If you have feedback to share, contact us. Q: Does tape for the 17 in. x 25 in. Tan Fabric Quilted Indoor AC Cover damage paint or wallpaper? Tape for the 17 in. x 25 in. Tan Fabric Quilted Indoor Air Conditioner Cover is meant to only be used on liner material. Do not use it on paint or wallpaper. Discover the energy-saving value of our indoor AC covers. Q: Is the tape that comes with the 17 in. x 25 in. Tan Fabric Quilted Indoor Air Conditioner Cover reusable ? The tape that comes with the 17 in. x 25 in. Tan Fabric Quilted Indoor Air Conditioner Cover is meant to only be used on the liner material and is not reusable. Q: My AC unit is slightly larger than your AC Cover, will it stretch to fit? No, it will not stretch to fit. Frost King Air Conditioner Covers are made to fit securely over your AC unit to help insulate your home. That's why they cannot be stretched. Get the next size up. Here's where to buy AC covers. Q: Can I get instructions for the Metal Air Conditioner Support Brackets? Yes. Download complete instructions for Frost King's Metal Air Conditioner Support Brackets. Discover other Frost King window air conditioner accessories to ensure year-round comfort. If you still need help, contact us. Q: Do I need to cover my Central or Window AC unit during the winter? Yes, it's a good idea. The EPA recommends:"in the winter, be sure to insulate room air conditioners from the outside with a tight-fitting A/C unit cover." Frost King has a full selection of AC covers to keep both your window AC units and central AC units covered throughout winter. See where to buy Frost King's cost-saving AC covers. Once your AC is covered for winter, add more protection from the cold with Frost King's window seal products. Q: How often should I clean my AC filters? The Deparment of Energy recommends that you replace or clean your window air conditioner filters regularly. Frost King has an entire line of Air Conditioner filters to keep your AC unit functioning in top condition, and your home's air fresh and clean. All AC filters are washable, re-usable, and can be cut to proper size with scissors. Q: Is there Anything I can do about a noisy AC window unit? Use the Frost King Air Conditioner Weather-seal to keep your AC unit from rattling in it's window pane. These highly compressible foam strips press into place around the unit and between the windowpanes. They dampen AC vibration and noise, and also reduce air leaks to the outside. Reduce uncomfortable drafts and heat loss. Everything you need to keep your AC unit in top condition. Supports AC units up to 80 lbs (ACB80H) or 160 lbs (ACB160H). Elastic straps are attached to provide a secure fit.